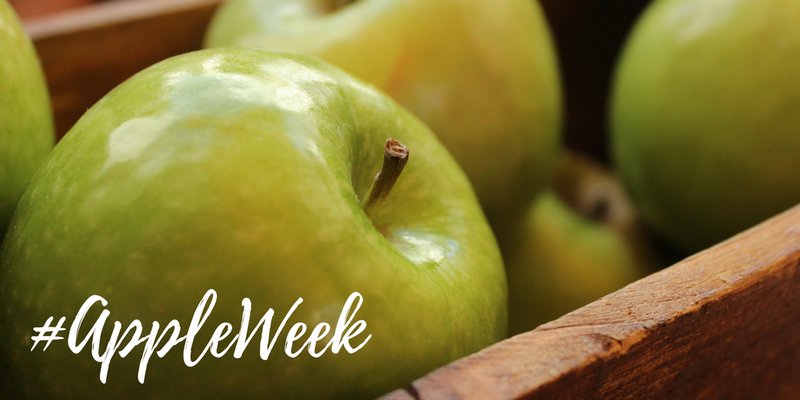 Casabella and Dreamfarm provided me with product to use in recipe development and prize packs for you to win in conjunction with #appleweek. All opinions are my own. 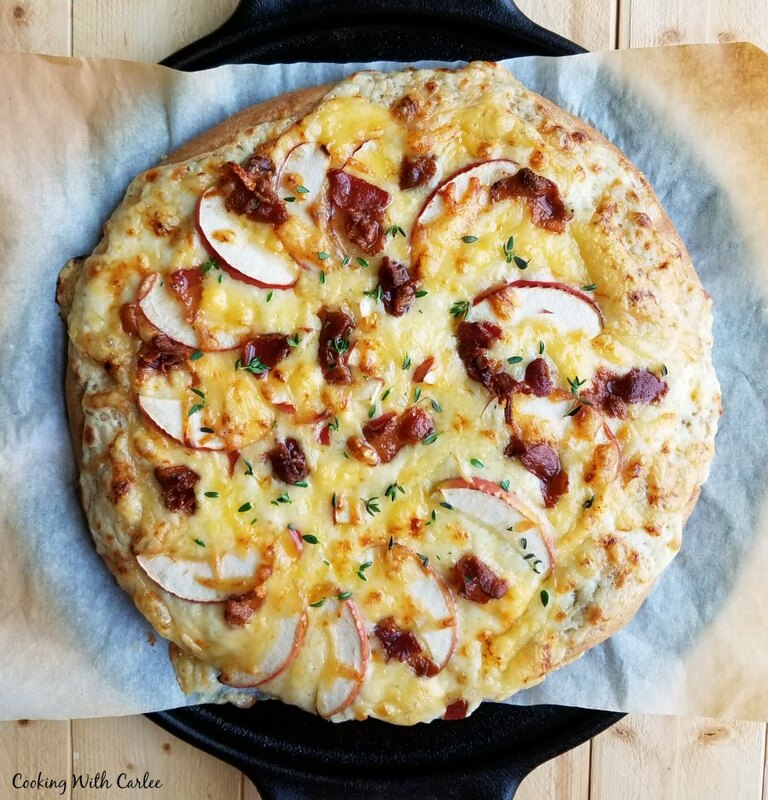 Here I am with a pizza on #appleweek and it doesn't involve a sugar cookie crust or any brown sugar. You didn't expect that, did you? Me either! 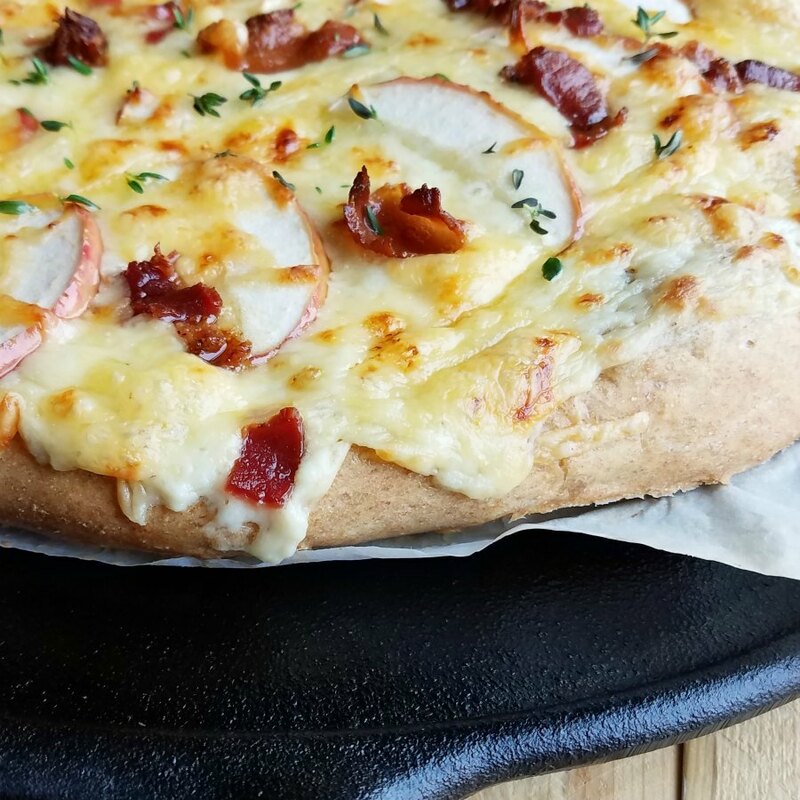 But here I am with a gooey, cheesy, melty, bacon topped pizza hoping you'll like it. Actually, I am sure you will! What's not to love? There's cheese! And apples! And BACON! Whew, please forgive me. All of this apple fun has gone to my head! You know Little Dude loves to help in the kitchen. So when Dreamfarm sent some Levups and Levoons for us to use in #appleweek recipes, he immediately claimed them. After all they are super fun to use and the ones we got are red, his favorite color! As the dough was rising, I got to try out my fun goodies from Casabella. 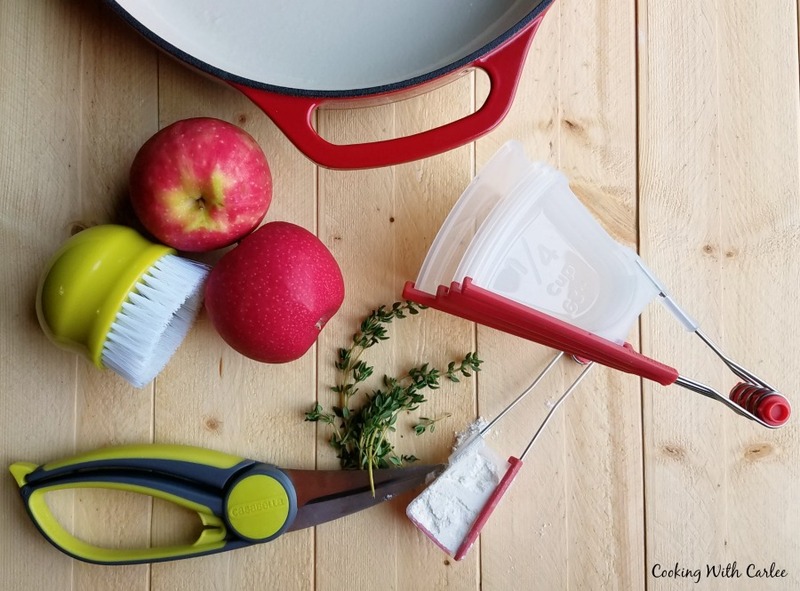 The 2 in 1 Veggie Brush did great on the apples and I can't wait to try the little mushroom brush that sits inside. Then I used the Clip n' Strip Shears to prep some fresh thyme. There's a slot where you pull the herbs through to get the little leaves off. I think it will work great for rosemary as well. Talk about convenient! I knew that a bechamel that was lightly flavored with mustard would be a great base. It is so creamy and we love it on croque madame pizzas. Some thin sliced apples, plenty of cheese and some crumbles of bacon later, it was ready for the oven. I love our cast iron pizza pan, but a stone would work great as well. Let me tell you how good this smelled while it was baking. Then I sprinkled some fresh thyme on top when it came out and the aroma was amplified. It was so hard to tale the time to take a few pictures for you. I really just wanted to dive in. Honestly, I knew my husband and I would be in heaven. I was less sure what Little Dude and his friend would think. Luckily they kept telling me how good it was as they munched away. In case you are worried about me after posting a healthy oatmeal recipe, a salad and a savory pizza on a week devoted to apples, you can click back to the applesauce cake to see I'm still my frosting loving self. But don't put your thermometers away just yet. I've got a pretty healthy fruit dip coming tomorrow, so you'll likely have more worrying to do! We are half way through the apple festivities and my must make list is a mile long(er!) What new recipes are you going to try? This pizza is loaded with delicious gooey cheese, bacon, apples and thyme. You will not believe how creamy and delicious it is, not to mention how good it smells! Preheat your oven to 475 F and preheat your pizza stone. In a saucepan, melt the butter over medium heat. Whisk in the flour and continue to cook for a minute or two. You don't want it to take on much color, just cook the flour flavor out. Pour in the milk and continue to whisk and cook until it thickens. Remove from heat and stir in the mustard. Adjust the salt and pepper to taste. Top dough with mustard bechamel. Cover with grated Gruyere. Arrange thinly slice apples and chopped bacon over cheese and bake for about 15 minutes. Remove from oven and sprinkle with fresh thyme. Slice and enjoy! Oh another apple WINNER!!!!! This looks scrumptious with the Gruyere cheese!! I would probably want to eat the whole thing myself..sorry boys, lol!! Ha! I wouldn't blame you one bit. I wasn't 100% sure how my boys would like it but Little Dude kept telling me how good it was and of course my husband kept going back for more. Even the neighbor kid scarfed a slice down. I'm having another proud Momma moment. You are so creative! I am pretty proud of this one myself! Thanks! Is it bad I want this for breakfast? I mean it has apples, bacon and cheese...all breakfast foods. It looks amazing! Not at all! It would make a great breakfast or brunch! Oh my goodness! You had me at Gruyere cheese!! I love that you found a way to use apples in your pizza! You are so creative. 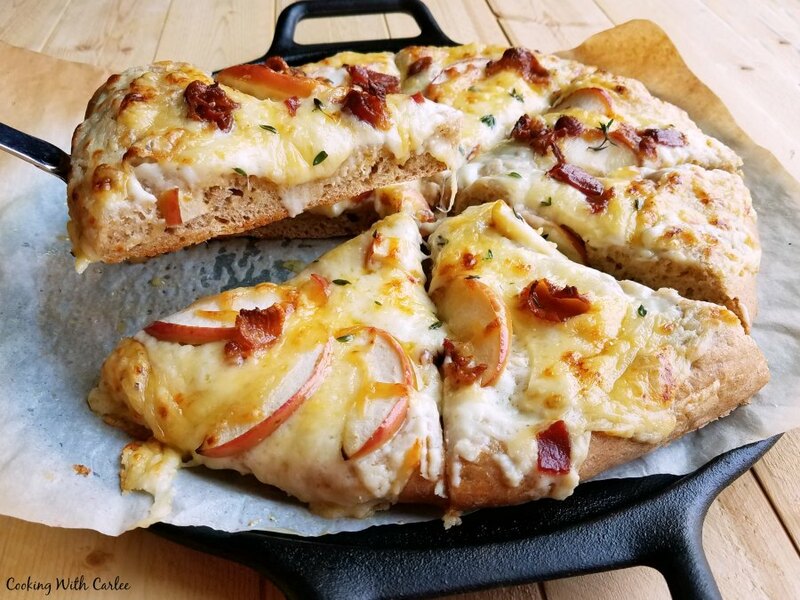 Thank you for sharing this apple bacon pizza. Your little gadgets look fun. Oh, my goodness gracious, I would LOVE a slice of that. Right about now. Thanks for sharing the recipe, Carlee. And thanks, too, for organizing this amazing event. Thanks, Camilla! I just love seeing how your creative mind works! Such a lovely fall pizza. And I love the combo of apple and bacon. Yum! They really work so well together, don't they? Thank you! I just love the flavors for your pizza! Thanks so much for sharing your awesome post with us at Full Plate Thursday and come back soon! Yummy! 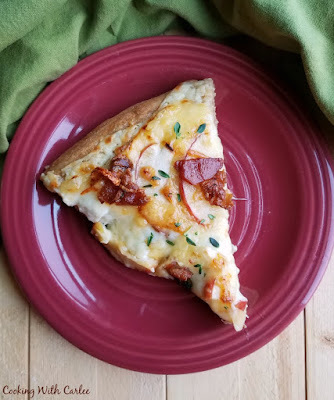 What a great twist on pizza. Thanks for sharing on the All Things Apple Celebrate 365 Blog Party! Thanks, Val! We really enjoyed how it turned out! Oh my, does this ever look heavenly! Now this is my kinda pizza. Thanks so much for sharing with us at the Whimsical Wednesdays Link Party!